Combo - Becca Pressed Highlighters 'Champagne Pop' & 'Moonstone' : I know, I know...a little over the top to be using not one, but two highlighters. But hell, this whole favorites is a bit over the top when it comes to glowing/shimmering skin. Champagne Pop is a bit on the peachy side and Moonstone reads a bit more neutral, so combined they make the most gorgeous glowy highlight. I also favor Champagne Pop as a shimmering eyeshadow and Moonstone I use more to highlight the brow bone and inner corner. Marc Jacobs UnderCover Coconut Face Primer : This primer has been on my list for absolutely ages and I finally decided to bite the bullet and pick it up at Sephora last month. I am so pleased with it. I've gotten multiple compliments on my skin after using this for the past few weeks. People noticing my skin looked healthy and glowy - even without makeup and just wearing this. It's ultra hydrating and doesn't leave any type of sticky residue or layer. It dries down beautifully, but allows the skin to keep a really nice glow. Becca Backlight Priming Filter : For someone who originally didn't even like primers, I'm amazed that I'm totally addicted to not one, but two of them now. 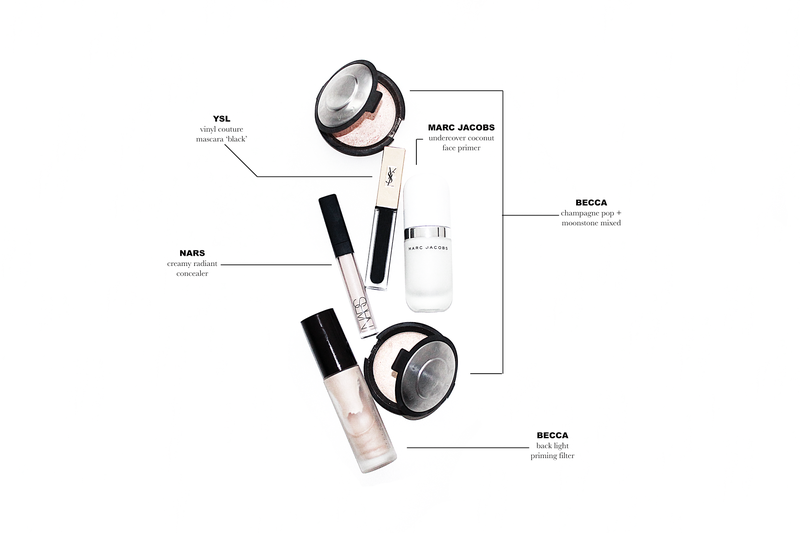 This primer is one I actually place sparingly over top of the Marc Jacob's one. I like to highlight the high points of my face with it, to give some extra glow. Can you tell I'm all about that almost sweaty glow... I also love this primer all over the face as well, for the first few months of the year I used it exclusively (if you couldn't tell by how much of it is gone from the bottle). NARS Radiant Creamy Concealer : I used this concealer for ages and then strayed away from it. I ran out and instead of buying new I tested products that had landed on my doorstep via brand samples. I found a few gems, but as you can see I finally made my way back to my trusty NARS. I can safely say this is still by favorite for full coverage, yet non-cakey concealer. It's creamy, it doesn't crease, and it does it's job well. I always apply it with a damp beauty blender and find that works best. YSL Vinyl Couture Mascara 'Black' : I have to admit this purchase was inspired by Lydia Millen and also 100% because of the packaging. However, it's a killer product. I've gotten a lot of questions about what mascara I've been using lately and it's all due to this guy. The formula is a "wet look" so dry mascara lovers take note. It builds up a lot of thickness/volume easily and definitely lengthens. It's also jet black, so it really packs a punch. The absolutely gorgeous packaging also helps.